Kotobuki Coffee has launched a promotion highlighting a unique aspect of the modern Japanese café experience. This promotion, titled Kiss of Rose, is based on the flavor, texture and aroma of the rose flower, through infusion with fruit and drinks, as well as deserts. While basically a presentation of a contemporary Japanese culinary exploration, the event is also a chance for diners to experience a once-in-a-lifetime sensory bliss, with all five senses being treated to the uniqueness of the culinary concept. The promotion starts from 2nd June till 31st July 2017. Design Highlights: With its rustic and earthy brick walls, ambient mood lighting and chic interior, Kotobuki Coffee is styled like a modern Japanese café and is the perfect place for a coffee and grub fix in the heart of Orchard Road. Kiss of Rose evokes a plating that draws couples and diners seeking a refreshing ambience. Each set comes poised with a lavish white grand toy piano, alongside a french tea press and a plate of dessert. The theme itself is meant to utilise the five senses, so diners can enjoy a unifying experience with all of their senses being aroused. 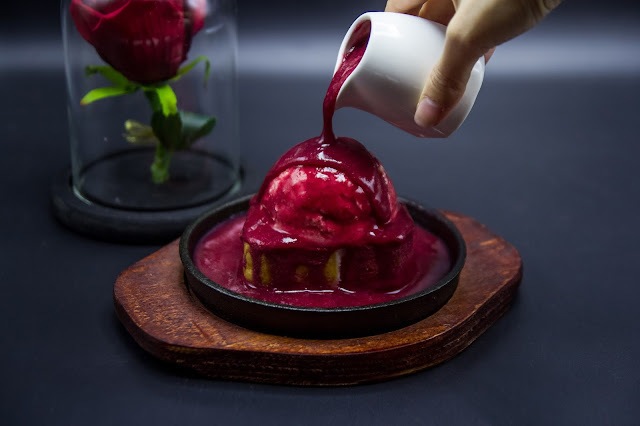 The sense of Sight will rely on a mesmerising visual presentation, such as the ice rose berries being poured on a hotplate, as well as the general rose décor. The sense of Taste, of course, is nothing but the indulgence on the food served. The sense of Smell is evoked by the various aromas and scents wafting from both the surroundings as well as the food. The sense of Touch will be rewarded in the figurative sense, through the magical touch of the décor and the personal service from the crew. The sense of Hearing might not be as much as an enjoyment for many— some would love the chatter and sounds from the noisy and vibrant cafe while others would prefer a quiet spot. Set 1 consists of a piping hot Rose Moscato tea, cotton candy and a choice of Rose Soufflé Cheesecake or Ice Rose Cheese Tart. 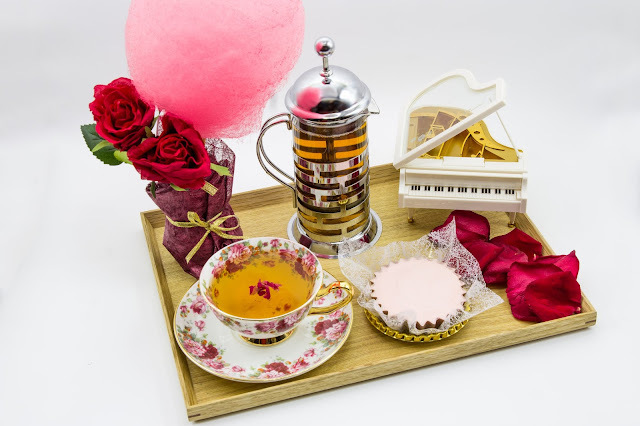 The term ‘Raining’ is used to describe the way the cotton candy melts from the steam and heat from the tea, forming a smooth, silky texture which resembles raindrops. 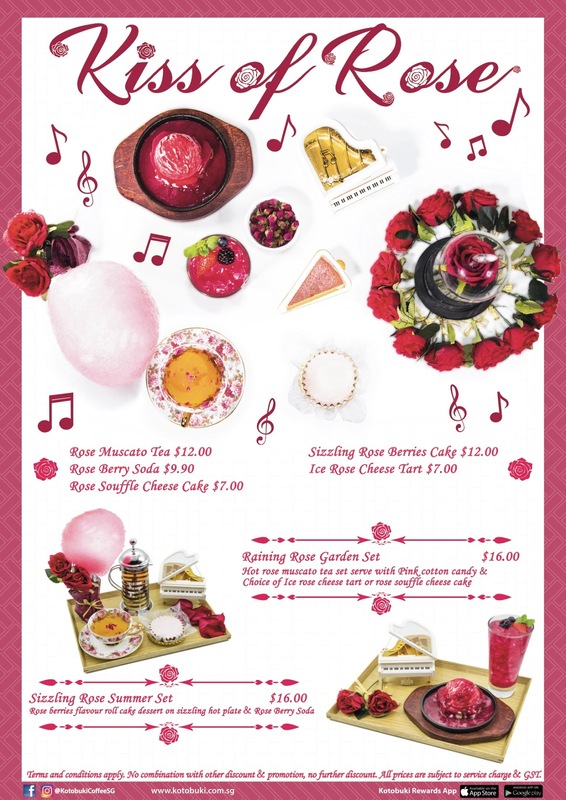 This set features a berry flavored roll cake with a hint of rose on a hot plate, along with rose and berry soda. 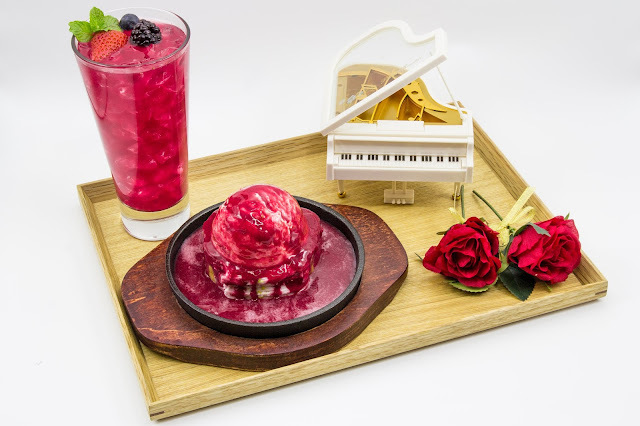 The rose and berry soda is a concoction of rose essence mixed with four types of berries— strawberries, blueberries, raspberries and blackberries. According to the owner, the soda contains no added sugar and is loaded with vitamins. Kotobuki Coffee is a Japanese coffee house which offers Japanese-Western casual dining. Kotobuki prides itself on serving authentic Kanto-style Japanese dining in Singapore since 1981, constantly keeping the menu fresh for their diners with exclusive themed specials every month. Kotobuki Coffee, its sister outlet located adjacent to Kotobuki Restaurant at Wisma Atria, is its latest Japanese cafe house concept, specialising in Japanese-Western fare and its signature coffee drip techniques. $2.40 for 1st hr, $1.20 for next subsequent 30min from 7am to 5pm. $3.50/entry from 5pm to 7am on the following day. SAT: $3.60 for 1st 2 hours, $0.80 for next subsequent 30min from 7am to 7am the following day. The images, as well as article, is a media alert from Kotobuki's PR agency.